The long week end of the Immaculate (from the Wed 7th December – saint Amrogio till Sun 11th Dec) is getting closer: many are the events planned both in Bormio and in the Valdidentro area for celebrating the first winter week end. .
Thursday 8th Dec: the first night skiing of the season: slopes will be open till 11.30 pm.. 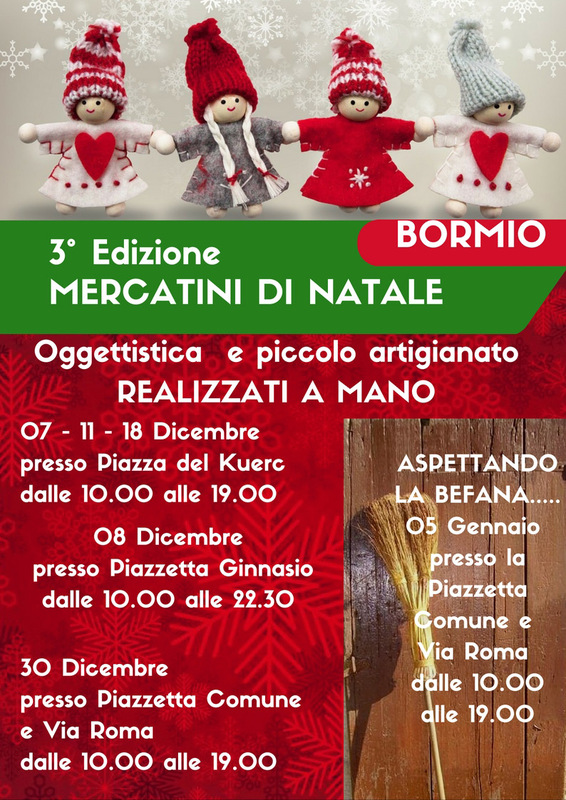 Many the events with the traditional Christmas markets, waiting fro you in Bormio on the 7th and on the 11th December in Cavour square (Kuerc) from 10.00 am till 7 pm, on the 8th December in Ginnasio square from 10.00 am till 10.30 pm; in Valdidentro , IV november square (Isolaccia) from the 8th till the 10th December and in Santa Caterina, K2 square on the 9th December from 10.00 am till 6.00 pm. Thursday the 8th December 2016in Valdidentro it will be hold the talent show “Ti sci che t’esc bon”..
Sunday 11th December in Sondalo it will come back the VI edition of “Chocolate Roads”, a market dedicatedto chocolate in the city centre streets in Sondalo, where everybody can taste a perfect hot chocolate and many different kinds of sweets, with enertainment both for adults and kids. 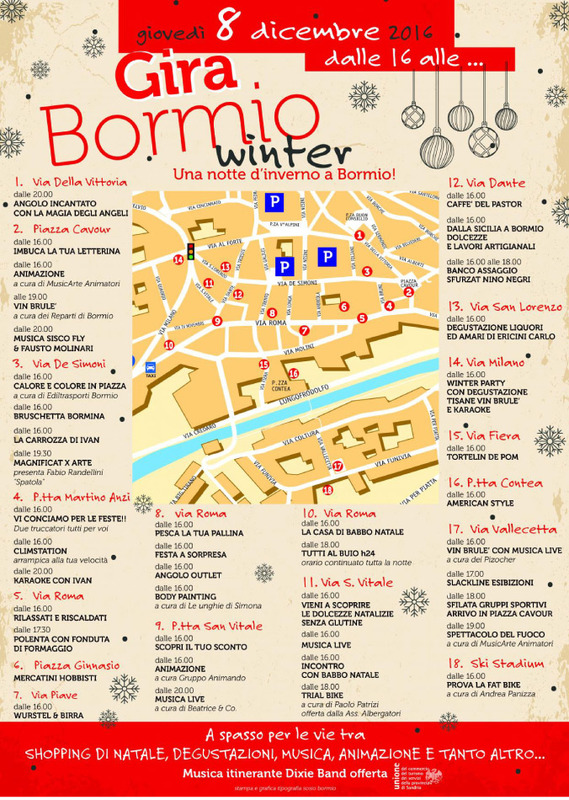 On the 8 th December, all the shops in Bormio City will be open till late because of the Winter GIRA BORMIO, a shopping White night with entertainments along the city streets both for adults and kids. The event will start at 4 pm. 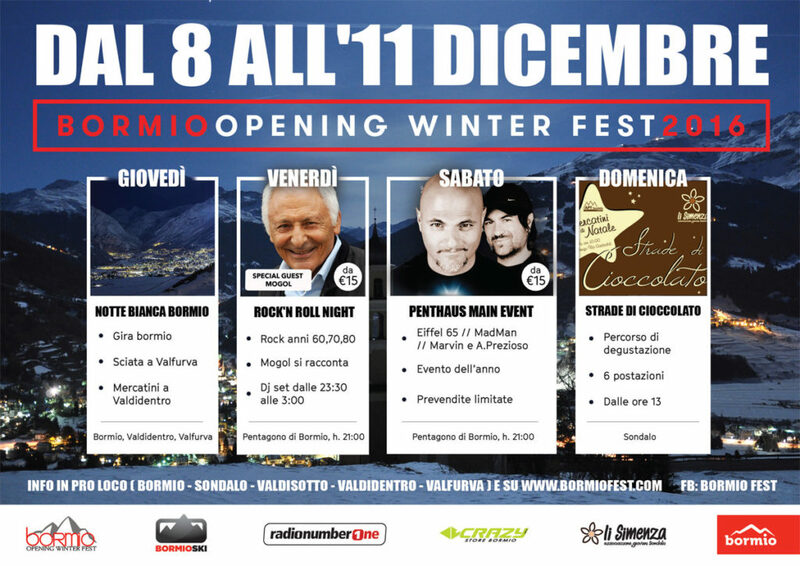 Finally, in all the evenings of the long week end, Bormio will offer for the fisrts time a very important musical event: Bormio Winter Fest, on opening celebration for the Whole season. from 9.00 pm to 5.00 am Bormio Penthaus Event, with Madman, Marvin&A.Prezioso and Eiffel 65, the most famous Italian artist for celebrating in Bormio.